What is the Difference Between Cuties & Halos? Disclaimer: Some of the links you will find below are affiliate links, meaning that at no additional cost to you, I will earn a commission if you click through and make a purchase. The produce world can be a confusing place at times. We got sweet potatoes sometimes called yams, we called cabbage that looks clearly purple, red cabbage, and what are those little orange fruits that come in 5 pound boxes? Clementines, Cuties, Halos, Dimples, Suki, Tangerines, Mandarins? The world of single serving, easy to peel citrus can leave one wondering. I am going to shine my years of produce experience on the subject today and talk about what is the difference between the popular Cuties and Halos. In the process I am doing my part to prevent any of these terms from becoming the next Kleenex (genericized term to refer to all facial tissues). If you answered D you are correct! How can that be? Let’s start with the most basic thing. Whether it’s a Cutie or a Halo it is a mandarin. A mandarin is “a small flattish citrus fruit with a loose skin, especially a variety with yellow-orange skin” (thank you Google dictionary). It does not have to be seedless but in the case of Cuties and Halos, it is. What the name “Cuties” and “Halos” comes down to is marketing names. They are not actual varieties. The name “Cuties” is owned by Sun Pacific. The name “Halos” is owned by Paramount Citrus, who also has the trademark POM Wonderful. Paramount Citrus use to own the “Cuties” name. A split occurred in the company and Sun Pacific parts with the “Cuties” name. “Halos” is the brand name that Paramount choose as a replacement for “Cuties”. Here is something that I don’t think most people know. 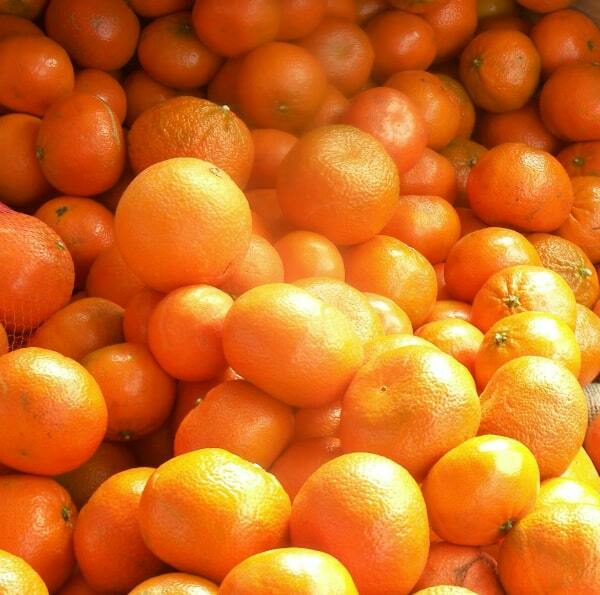 Cuties and Halos are different types of mandarins depending on what time of year it is. They are not always the Clementine variety. In fact, Clementines are only available during the beginning part of the citrus season (from November to January). The other mandarin commonly used is the W. Murcott. Often I see grocery stores naming even the Murcotts as Clementines as that name sells better. Just look at the calendar and you will have an idea of what you are really getting. By entering your email address below you are signing up for our Citrus email newsletter. You have the option of opting you at any point in time by choosing to unsubscribe at the bottom off the email list or by contacting us. Are Cuties and Halos Always Seedless? Have you ever found a seed or two in either a Cutie or a Halo, or any other seedless mandarin? What gives? Read my post on Why There are Sometimes Seeds in Halos or Cuties. The Cuties and Halos brands are NOT in store year round. By spring, usually in May, maybe even early June, they disappear until next fall. For when that happens you can buy mandarins in their dried form. They make for a great snack year round. Just for kicks, I decided to film my son in the grocery store. I had him pick if he wanted to buy the Cuties or the Halos. I wouldn’t call this a perfect scientific study, but he sure is cute making his choice. If you are interested in learning more on mandarins as well learning about how to better choose fruit and vegetables here is some recommended reading. How to Pick a Peach – I can’t begin to tell you how much I love this book. I have borrow it from the library many times. The author Russ Parsons breaks down fruit and vegetables by season including mandarins. Russ gives a little history and the information you need to pick better fruits and vegetables. And it’s written in a way than anyone, even if you don’t know much about food, can read it. One of my most highly recommended books. Sometimes I am just not happy with the fruit in the grocery store. It’s mishandled and picked over. Citrus can be that way. Here is an option for ordering fruit online. Pittman & Davis have been finding and shipping quality fruit for over 90 years. They offer many different types of fruit including Clementines and the juicy Florida Honeybells when they are in season. You could just enjoy your Cuties, Haloks, Clementines, Tangerines, Mandarins etc as is. But when you got a big box of them why not play around with them a little more in the kitchen. I got a recipe below that will be way better than any orange chicken you find at your closet strip mall. The recipe calls for clementines but you can use any mandarin/tangerine you want. 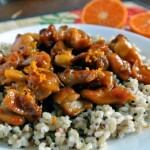 If you want the full lowdown the recipe, check out my post – Clementine Glazed Boneless Skinless Chicken Thighs. Otherwise scroll down for the recipe. 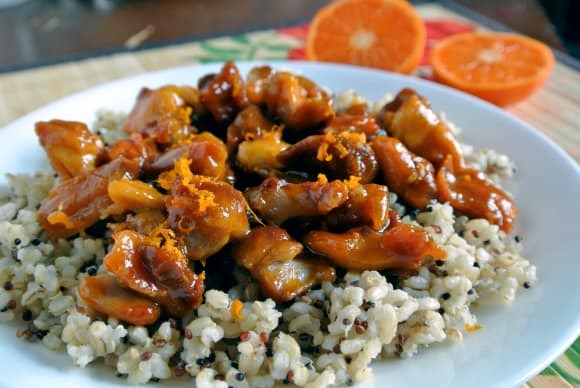 Make this Clementine glaze chicken!!! You can use Halos, Cuties, or any mandarin you want. Start by peeling 8-10 Clementines and place them into a blender or a container and use a stick blender. Place a sieve over a sauce pan and pour the mixture through it. Bring to a boil. Lower the heat to medium, so you don’t boil over. Cook until the juice it has begun to thicken and is almost a syrup like consistency, but not quite. Taste the glaze. Add more seasonings if necessary. Season with kosher salt. Then grab a large skillet or electric skillet, and place enough oil just to cover the bottom. Heat the skillet over medium high heat. When skillet is ready, place the chicken inside. Cook until the chicken pieces have browned all over and there is no pink in the middle. Love the halos and the cuties.I wish I could get them all the time. You’re welcome. Thanks for the comment. Thank you for the information. I have always preferred the Cuties, just seemed sweeter to me. So I asked a produce manager at Jewel Food Store in Dyer, Indiana, yesterday. He tells me that Cuties and Halos are the very same, no difference except the name. Then proceeds to tell me that the same family owned Cuties, there was a rift and one got the name Halo and one got to keep Cutie and they were all grown in the same orchard. Somehow that didn’t seem right to me, so that’s why I asked this question of you! Appreciate your info. Thank you! Glad you like this one! Love the Cuties and Halos. They are perfect in every way. Rarely buy Clementines anymore. They were great when they first came out but anymore too many distributors of them. As of late they are tasteless, seedy and hard to peel. I hope that doesn’t happen with the Cuties and Halos. Too many hands in the pot can often ruin a good thing !!! Thank you for this information. But just for clarity, if I have a recipe (Clementine-Fig Spice Cake) that calls for clementines, is it ok to use Cuties or Halos? Two companies tried to work together and it didn’t work out at all. Thanks for the comment. This time of year Cuties and Halos are a different variety than they were at the start of the season. Now they are most likely either Tangos or Murcotts. Murcotts can have seeds if the bees pollinate them. So that is why you are finding seeds in them. And often when a citrus variety first comes out for the season they are rushed to market without enough time to develop enough sweetness. I had a Murcott mandarin off a tree in California in late March and it was ridiculous good and sweet. The problem with Cuties and Halos and other name varieties is that the consumer isn’t directly told that they are using different varieties on the packaging, so people think that they are all the same, but they aren’t. I hope that helps. Let me know if you have more questions. Yes. You could use any type of mandarin or even any kind of orange. The flavor will vary upon what you use, but anything would work. Let me know what you use and how it turns out. I don’t know the answer to that question, but it something to look into. Definitely possible they have similar practices being they worked together at one time. I love them all, but read on that paragon of academic excellence, Facebook, that they’re grown in the toxic waste water of a large corporation. I won’t mention names, but you get the idea. Any truth to this? Cuties are better, because Halos are grown in Delano, California. I’ll let you figure out what “del ano” is Spanish for. Have you heard that these companies use toxic water to grow their fruit, is this true? I heard hear reports of this, but haven’t look enough into to know for sure. It’s definately something that is on my radar. Thanks for stopping by! So then we can’t buy them from May to October? Is that why I can’t find them at any of the Walmarts? Yep. You are correct. They are now out of season. You may find some seedless mandarins imported from places like Chile. but I never find them to be very good. Not worth your money. Thanks for clarifying this for me. Good info. Every time I shopped, I wondered what the difference was, but by the time I got home, I never remembered to google. Which are the really sweet ones? I just bought a 2lb. bag of Halos and they are harder to peel and decidedly tart and acidic. I don’t like them. Please offer guidance as to how t buy the really sweet ones. Thanks. That is not surprising to me all. These are the first of the year and often are not very good. I think they are rushed to market before they are ready in terms of flavor and sweetness. They also don’t peel as well either until later in the season. Honestly I would avoid buying them completely right now until at least after Thanksgiving. I never find that any citrus is worth my money until at least December. Hope that helps. Me, I live in Florida, & eat a really good Mandarin–satsumas, picked right off my tree. That’s awesome. Satsumas are really good. Typically better than the Halos or Cuties brand clementine mandarins that are out at the same time. Your son is too cute, reminds me when my sons were that age. Best wishes! My Halos WC JD326^ B57029 were hard to peel.Were they picked too soon???? That’s possible. The ones picked early in the season tend to be harder to peel than ones available later on in the season. Flavor and ease to peel definitely changes throughout the season for sure. Some Cuties and Halos feel soft and others feel hard. Does this affect the taste? It all depends. If something feels really hard and looks darker on the outside and the skin looks rough than it old and most likely dry. Soft may not be bad as long as there aren’t spots that you can poke your finger through. Sometime mandarins’ skin will separate some from the fruit inside. This usually means more mature fruit, which should have better flavor and sweetness. Thank you for clearing up the differences of the two! I am a Cuties/Halos nut! Right now there is a Christmas box below my feet of the “Happy Halos” variety that I feel asleep to and woke up to. My wife is getting worried I’m addicted! I am curious, do you know of a company to order the best oranges that you can order on line? the local stores never seem to carrie delicious organges anymore. My parents used order me a box from Florida, and they were the best! Here are a couple ideas for great oranges – Friend’s Ranch in Ojai, California grows some amazing citrus. I visited there a couple years ago, wonderful fruit and people. Also make sure you download my FREE Citrus Season Passport. This will help you find the best varieties in the grocery store throughout the season. Hi just curious… its august and cuties are again available in store. Usuallly I do t see them until the fall. Can you explain? Those are from other countries, like Chile. They usually aren’t very good, so I never buy them this time of year. I posted 25 months ago. To update, a bumper crop of satsumas this year–400+ on the tree. & sweet & tasty. I’ve been giving them away as fast as I can. Even ate a few. Anyone who lives south of 30 degrees N longitude should consider planting a satsuma. They’re cold-hardy & self-pollinating.Mature trees require zero care or attention. No thorns. Fruit is terrific, & never gives canker sores.They ripen very early, too.